A drama about the struggle to adhere to higher ideals, The Nun's Story is a sincere exploration of the conflict between two competing aspirations, both admirable. In Belgium of the late 1920s, Gabrielle "Gaby" Van Der Mal (Audrey Hepburn) enters a convent to start the process of becoming a nursing nun. Her father Hubert (Dean Jagger) is a famous surgeon, and Gaby's ambition is to provide medical services as a nun in Congo. Gaby commits herself to learning the proper habits of a nun, including long periods of silence, letting go of her past, frequent prayers, and public confession of every transgression in front of all the other nuns. Gaby makes good progress, takes her vows, and is granted the title Sister Luke. But she continues to struggle with the concept of absolute obedience and complete humility. Her background as the daughter of a recognized surgeon is a point of pride, and her love of medicine competes with her dedication to religious ceremony. Sister Luke serves a stint in a Belgian mental hospital, and is finally assigned to the Congo, where she is disappointed to find herself stationed at a hospital for white people rather than helping the locals. 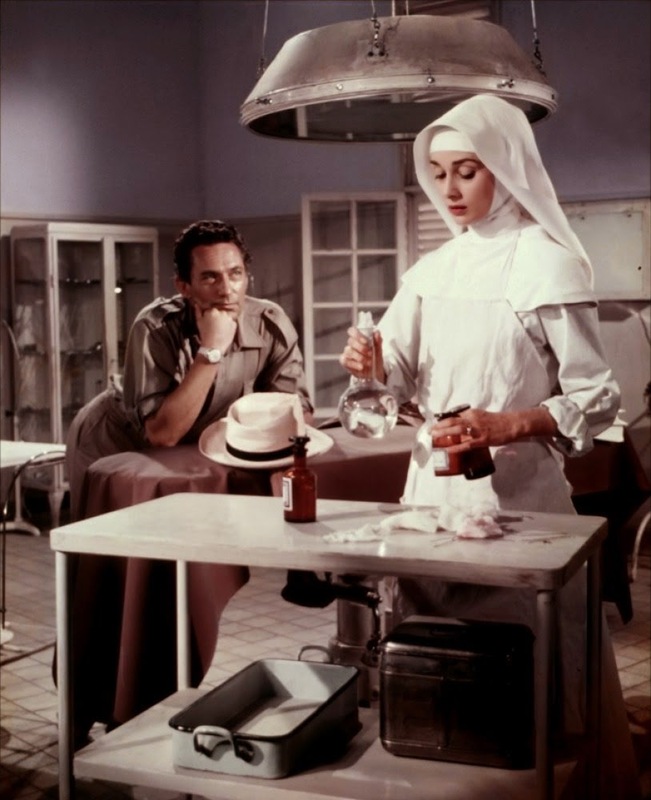 But gradually she proves her value, and is assigned to help the abrasive Dr. Fortunati (Peter Finch) as his head surgical nurse. An unconventional emergency surgery, an unexpected illness, and a shocking incident bring Sister Luke and Fortunati close together, but she is called back to Belgium. When World War Two erupts, Sister Luke is forced to assess the discord between religious duty and the longing to pursue medical and political involvement. Directed by Fred Zinnemann from a Robert Anderson adaptation of Kathryn Hulme's book (based on the life of her friend Marie Louise Habets), The Nun's Story is involving without necessarily touching the emotional heights that it aims for. The evolution of Gabrielle Van Der Mal into Sister Luke is a ponderous journey filled with introspection, self-evaluation, self-doubt and struggle to conform to an impossible ideal. This is a story about the search for personal fulfillment through individual endeavour, and for long stretches there is not much of interest going on outside of Gabrielle's discovery process and internal thoughts. The film unfolds like a documentary, an earnest depiction of the sacrifices and ceremony involved in dedicating a life to the service of others. The lack of a narrative thrust makes for a slow but educational first two thirds of the protracted 149 minutes of running time. 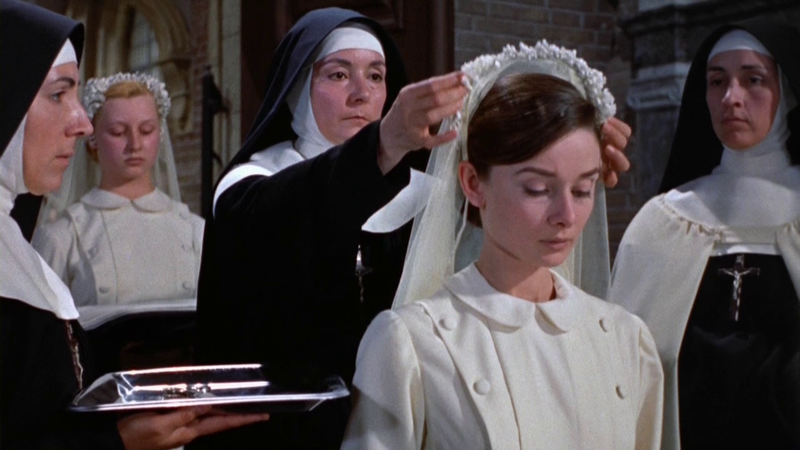 Hepburn as Gaby is almost silently swept along by the higher calling and fully immersed in unlearning any personal desires while striving for the appropriate inward and outward behaviours of a nun. The final third of the movie picks up the pace, as Dr. Fortunati proves to be a turning point in Sister Luke's life, then World War Two interferes and pushes for a conclusion about her aspirations and beliefs. The film finally offers a sharply defined dilemma for the main character to grapple with, and the dramatic quotient positively benefits. Zinnemann directs with his usual courtly approach, giving every scene stately time to breathe, impress and register. The initial transformation of Gaby into Sister Luke, which occupies the first hour, is filled with imposing ceremonies in the Mother House, allowing Zinnemann and his cinematographer Franz Planer to find impressive angles and capture lofty assembly halls filled with solemn extras, while the Franz Waxman music score adds to the ambiance. It's a visual and auditory feast, the dividend achieved from the leisurely pace. Audrey Hepburn was nominated for the Best Actress Academy Award, and her performance is a rewarding study in restraint. Hepburn conveys all her internal conflict from within an ocean of calm and through the briefest of blurted expressions, and only late in the film does she start outwardly expressing clear thoughts that challenge the rules of others. The coarse and refreshingly blunt Peter Finch injects plenty of energy, but is on the screen for a relatively short stretch. The rest of the supporting cast is a large but rather interchangeable sea of faces representing all the nuns that Gaby interacts with over the years. The Nun's Story is impressive and dignified. What the film lacks in intensity, it more than makes up for in quiet grandeur.